Some stories can be told and retold ad infinitum, and they will continue to entertain and delight – or terrify. The Giant Book of Giants has managed to stuff six such stories centered on giants into one book that will delight any giant-lovers you know, and they haven’t sanitized the stories for children’s consumption. 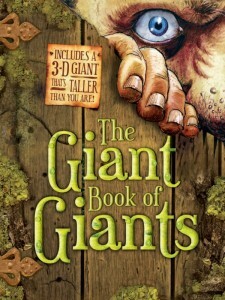 The stories include a wide variety of giants from around the world. Only two of the stories, Finn and the Buggane and The Curious Giantess, do not include roasting and/ or eating people, animals, and even the giants themselves. That’s no surprise since these are all retellings of folk tales, most of which are filled with carnivorous goings-on. Parents should be wary that the stories are told matter-of-factly. They could be used as conversation starters with older children, however, for younger children, at the least, they will ask why the giant in Jack and the Beanstalk chants “I smell children for my tum!” and at the worst, they will be horrified by the descriptions of a cow roasting or javelin’s being hurled into a giant’s eye in Sinbad’s Third Voyage. The four-foot giant pull-out is impressive, and children will undoubtedly find it fascinating and fun to explore the flaps and details. This giant giant does, however, hold a drumstick in his hand, so even this fantastic addition to the stories may not feel accessible to vegetarian and vegan families. Unfortunately, the appeal of the many cultures represented and the truly fantastic illustrations do not overcome the inherent stumbling blocks of traditional violence and dietary habits of these folk tales.